Safety and independence rank highest among the many reasons why seniors may consider walk-in bathtubs. The latest walk-in bathtubs offer a wide range of features, including jacuzzi water jets. More than one third of American adults will experience at least one fall every year (800,000 yearly hospital admissions). Because of problems with balance, coordination, and general mobility, individuals with Alzheimer’s are most vulnerable to falls. Fall prevention techniques and practices are thus critical to ensure safety. A person without mobility issues has to navigate getting in and out of a standard or old-fashioned tub. First, one leg is lifted to get over the high edge, a height of around 17 or 18 inches. In that moment, the other leg is being used as a balance. The other leg has to then be positioned on the slippery tub floor, with a series of other steps to position oneself in the tub. These are all tricky maneuvers when, in addition, the bath is over and these motions must be repeated, this time to get out of the tub and walk onto the bathroom’s now wet floor. A walk-in tub is helpful for those who need assistance with balance or have other mobility issues. In the face of such challenges, opening the walk-in tub’s door all the way out, or all the way in, and just stepping in over what this time is usually only a 4-inch high edge, is exponentially safer and easier to navigate. Another reason walk-in tubs are safer is because the user does not have to go from an upright position to lying on their stretched-out back. Walk-in tubs are also designed to promote safety and comfort with a molded chair that can be used to sit on while submerged in warm water. For people who use wheelchairs, the transfer from wheelchair through the bathtub’s wide open door can also be easily managed by a trained caregiver. The alternative for people who are wheelchair-bound is to be transferred onto a stool in the middle of the bath, and being deprived of an immersive, cleansing bath. Walk-in bathtubs are tubs that have doors that open and enable the user to easily and safely step over the little edge and “walk-in” instead of having to step over the high edge of traditional-type bathtubs. 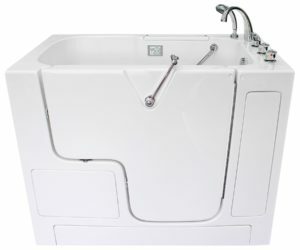 In addition, walk-in tubs have built-in and molded shower seats that are roughly 17 inches high, with a textured surface to prevent slipping off the seat. 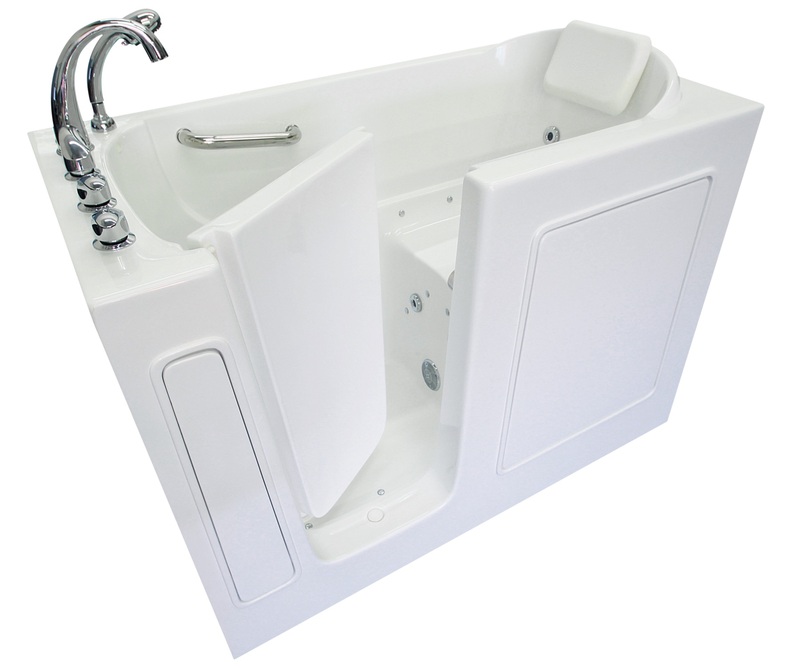 The seats in walk-in tubs offer a much safer bathing experience since the tub user can more readily step in and out of it, and allows bathers to be sitting upright while submerged in air-jetted water instead of lying down on their backs and soaking. They are thus tailor-made for individuals with mobility issues who cannot easily lay down and then get up. Many family caregivers responsible for loved ones with Alzheimer’s, Parkinson’s, or other types of dementia may be interested in finding out as much as they can about walk-in bathtubs before upgrading their bathroom. It has been reported by the National Institute on Aging that one in three seniors over the age of 65 fall and sustain a wide range of injuries every year. The vast majority of these falls occur in the bathroom, and a bathtub designed to meet older adults’ needs would help reduce these types of injuries. These modern bathtubs also have fast-acting drainage systems so that the user does not have to wait long for the water to drain before they can step out. They also have water-tight sealing around the door to prevent water from trickling out when the bathtub is filled with water. 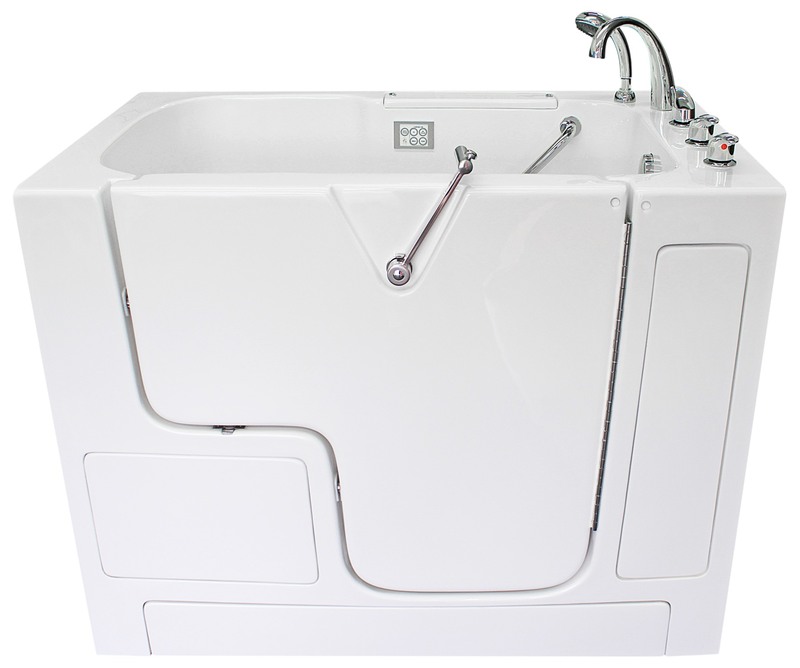 Walk-in tubs hold water with a depth of about 2.5 feet which allows for a thorough soak, compared to the traditional bathtub that holds up to 12 inches of water. Finally, the more modern versions of walk-in bathtubs come in different sizes, colors, and shapes, while more expensive models feature jacuzzi water jets and more. 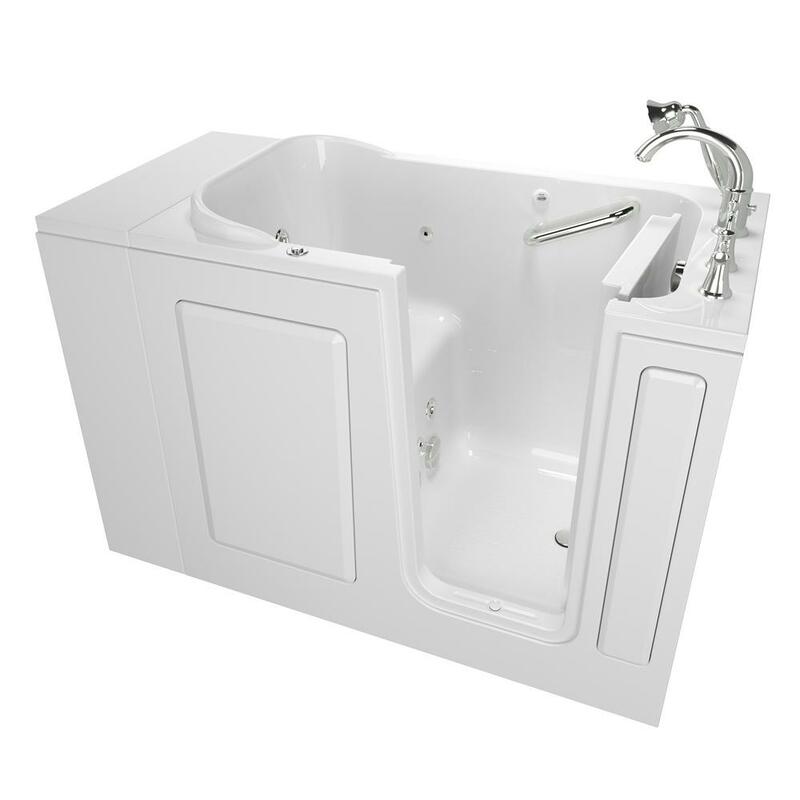 A Soaker Walk-in Bathtub: This is the most basic and least expensive bathtub on the market. It comes with a door seal to prevent water spillage when the tub is filled. A Hydrotherapy Walk-in Bathtub: This is a step-up from the soaker tub, with added features such as a water and air jet that is favorable due to its soothing and therapeutic effects. 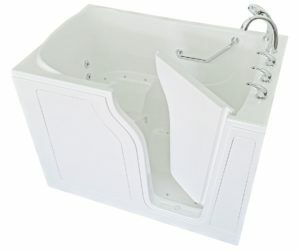 A Bariatric Bathtub: This is a standard walk-in bathtub that is made for larger or overweight adults and can be purchased or customized with a couple of add-on features. A Wheel-Chair Accessible Walk-in Bathtub: This type of tub has an outward-opening door which serves to enable a smooth transfer from wheelchair to tub. First, it is necessary to check if you can transform your standard tub into a walk-in version. This is at the discretion and authorization of the home owner, whether it is yourself, a family member, a landlord, or other. Walk-in tubs are not cheap, starting with figuring out how the contractor is going to break down and remove your old tub, replace it with your beautiful new tub, and then fix all the mess done on your bath’s walls and floor. How much money does all that cost? As little as a few hundred dollars, which is less common, to as much as $5,000 and higher. Although many manufacturers want to sell you on an all-in price to include the tub itself and its installation, many consumers have found it cheaper to choose the option of having another contractor do the installation. The only advice we can give you in that regard is to do your homework by checking the reviews on both the manufacturer as well as the independent contractor who will do the installation. The luxury walk-in tubs can cost upwards of $10,000, although those typically include fancy showers and features that you may never get to use. The list of manufacturers who currently produce walk-in tubs, at varying prices, seems to be endless, giving you many options. In the next section, we will give you some guidelines as to how to select a walk-in tub to suit your needs and budget. Unfortunately, as you might have guessed, neither Medicare nor a typical health insurance policy will help with the high price of walk-in tubs. Both the fear of falling and the fall itself are real concerns for older Americans. Although falling is not an inevitable result of getting older, falls are the most prevalent age-related hazard, mostly occurring inside and around the home. For older people in the U.S., falls constitute the foremost cause of fatal and non-fatal injuries. Older Americans indeed have cause to be extra weary of how they walk and move around and go up and down stairs, for slipping and falling, at best, threaten their safety, independence, quality of life, and pocket book. Even falls that do not produce injuries have a heavy toll on older adults, for fear of falling often prevents them from staying active and expanding their activities. This pattern inevitably results in added sedentary lifestyles among those who badly need physical activity for obesity, diabetes, hypertension, and possibly even Alzheimer’s or other types of dementia. That same fear can also lead to social withdrawal, depression, and heightened feelings of vulnerability. More than 300,000 Americans aged 65 or older are hospitalized each year with hip fractures of different types, and of those, only approximately 25% survive the initial 12 months following their fracture, while the rest live longer, though with a vastly diminished quality of life. A broken bone or joint may not sound all that dangerous, but if you’re an older person, you can pay a heavy price for broken hip surgery. You could be on your way to serious disability -or worse. The best-case resulting scenario is typically still characterized by a decline in independence and quality of life. Among older adults, the majority of fractures are caused by falls, and a large number of all falls cause broken bones. The most common fractures are of the vertebrae, hip, upper thigh bone, pelvis, hand, arm and forearm, leg and ankle. The impact of falls, particularly on our relatively bone-brittle seniors can be massive, frequently leading to ghastly injuries, stressful visits from medical first responders, a trip to the nearest hospital and, only too often, death. People with Alzheimer’s disease or some other type of dementia are even more at risk. Not only do they frequently experience balance, coordination, and vision issues but, because of their mental impairment, their spatial awareness is also suspect, and the multiple medications they take may make them groggy and/or dizzy. Because older adults spend the vast share of their time in the home, the largest part of all falling incidents happen at home. Researchers have also revealed that the majority of injuries are caused by falls not from falling down stairs, as might have been expected, but from falls happening on the same level and from a standing position, such as tripping while walking. It thus makes good sense to conduct a thorough investigation of fall risks around the house and take action to mitigate both the obvious and less evident hazards. A home full of clutter is asking for trouble. Make it a rule in the home of a person with Alzheimer’s to routinely put pieces of furniture and other odd items away neatly where they belong, and keep passageways clear. Keep all the areas where the person dwells well lit, and place night lights throughout the areas of likely passage such as from the bedroom to the bathroom, back and forth to the kitchen, and on any staircases that may be used. Replace throw rugs throughout the home with slip-resistant rugs, and fix other items sternly on the staircase so that handrails and possible carpeting are fastened securely. Pay special attention to the bathroom where the majority of accidents occur. Bump-proof all the sharp edges, and use slip-proof rubber mats that don’t move or twist on the bathroom and shower floors, and also use textured adhesive on the tub floor. Grab bars are critical for your loved one’s safety: by the toilet, tub and shower, and on the wall on the opposite side of the tub. Any water spills on the floor of the bathroom and kitchen should be quickly mopped and wiped dry. Take regular inventory of all the meds your loved one takes. Your doctor or pharmacist can counsel you as to the specific medications that cause interactions or symptoms such as lightheadedness or drowsiness. Large-fitting slippers can be hazardous, as can high heels. Use snug-fitting slippers and shoes with non-slip soles. Use Velcro wherever possible instead of shoelaces. Pets cause tumbles and falls as they dart around, so make sure your household pets don’t get in your loved one’s way when he or she is moving about the house. Aging eyes require extra care. It’s important to get a proper exam regularly from an ophthalmologist as well as visiting an optical retailer that has appropriate options for your loved ones. Your optician should be well-versed on the main features that are required when choosing glasses for an older face. If replacing an old tub or shower with a new walk-in bathtub with features like air water jets, an accessible door, and molded seats fits within your budget, it can be extremely beneficial to the overall quality of life of an older loved one. A person with dementia or physical limitations can take advantage of the new fixture in their bath, as well as the caregiver who will, as a result, be under less stress during bath time. A walk-in bathtub is safer to navigate due to the far lower barrier of the tubs, especially for people with dementia or mobility impairments. The installation of the new walk-in tub can cost anywhere from $500 to a several thousand dollars, while the bathtub itself starts at a little over $1000+ for the basic “soaker,” and goes up to $10,000+ for the more luxurious and intricate models with add-on features. While home modification can be expensive, some feel you cannot put a price tag on the comfort of remaining in your home as you age. If you or your loved one is one of these people, there are many options available to you.